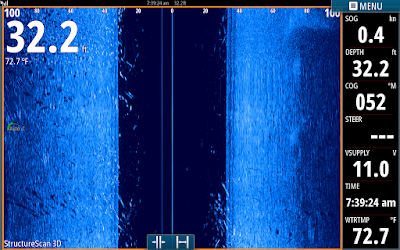 Here are a few screen shots off my Simrad using Chirp with a Chirp Transducer and Broadband set on 200khz. Broadband [200khz] sends out pings of the same frequency in a narrow cone...ping ping ping ping, kind of like shouting a semi automatic gun squeezing the trigger for every shot. Chirp on the other hand sends out multiple frequencies, 150 khz to 250 khz, on high chirp but it is more like an automatic gun sending about 100 different cone frequencies at once. In these pics I was using Medium Chirp which is 85 to 155 khz, shooting 70 cones out at once, all different frequencies. Chirp is built into my processor and you must have a transducer capable of Chirping to get the full benefits of it. If you are Chirping through a broadband transducer, 50/200 for example, in high Chirp you are probably sending out a couple of different frequencies through that transducer verses 100 with a chirp transducer set on high Chirp. With Chirp you get better resolution and much better definition on your screen. Chirp separates targets better and works especially well looking at structure such as drop offs. This is a very short and condensed explanation of Chirp and here are a few screen shots to look at. In this screen shot I have 200khz on the upper left screen and Medium Chirp on the right screen. I am using a HST-WSBL 83/200 for broadband and a TM 150 Airmar Chirp transducer for Chirp. 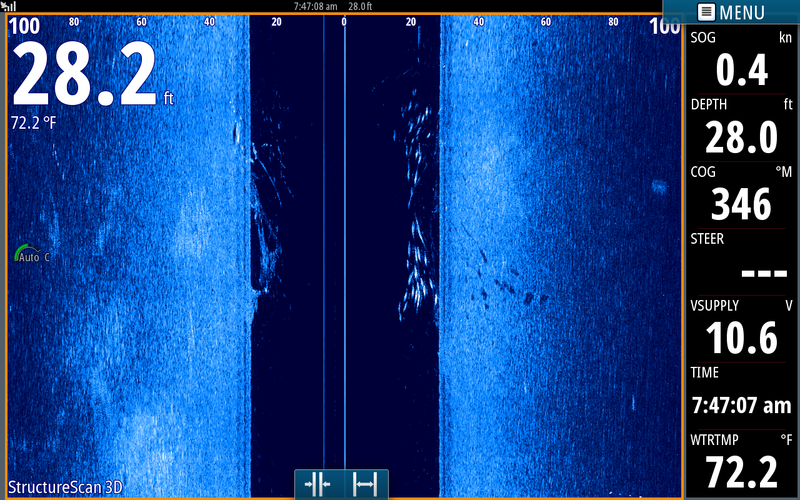 On the broadband side you can clearly see the bottom, a school of fish coming up on the right side of the screen, a fish coming off the bottom coming up to look at a bait and a couple of small fish on the bottom. Looking a Chirp I see many more fish, I see three fish streaking off the bottom, and I see my downlines set at 15 to 20 feet being pulled into the school of fish. This scenario is with a 30 foot deep bottom. When I am fishing deeper say 40 foot deep I can see as many as six different baits at a time and can watch the fish come up and hit the baits. You can also see numerous small fish on the side scan. This school was a bunch of punks 15 to 18 inches long. Look at the difference in these to sonar screens. The Chirp side definitely showing more fish with better definition. If you notice I have my broadband sensitivity set at A+1 [one increment above Auto gain] and my Chirp is actually set at A-2, 3 settings below what broadband is set at. I do not use as much sensitivity or gain with Chirp because it is much more efficient. 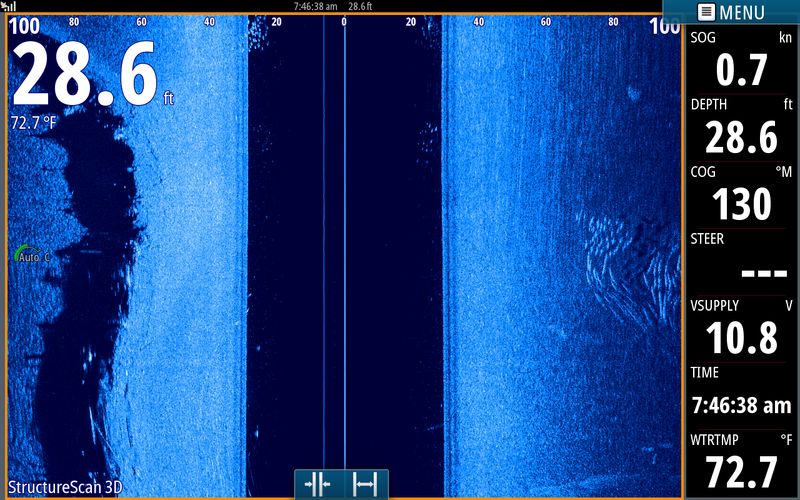 Also you can see some fish on side scan off the the left of the boat. By the way, these fish are mostly Catfish. 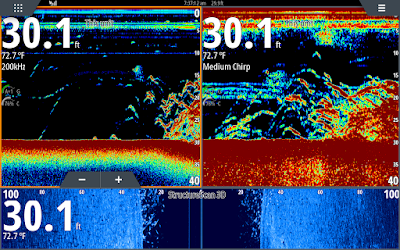 The Chirp screen is showing all the fish under the boat which you can distinguish the various sizes of the fish. Chirp utilizes many different frequencies in each of its Low, Medium and High settings. Naturally there are different uses for all three, but basically High Chirp works better in shallower waters lets say 200 feet or less, Medium Chirp works better in mid depth ranges and Low Chirp is used in very deep waters. Most good depthfinders today are available with Chirp but make sure to match the right transducer with it to reap all the benefits from it. Chirp is an upgraded version over broadband but is it necessary for your type of fishing...you have to decide. If you have a unit that has Chirp you may want to check it out! We will be at the Fishing Expo this weekend in the Greentop booth, come on by and check us out. Hope to see you there! 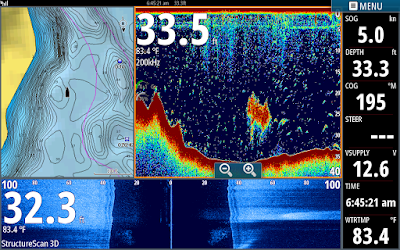 Understanding the benefits of Side Scan can be invaluable to any fisherman whether looking for structure, fish or bait. 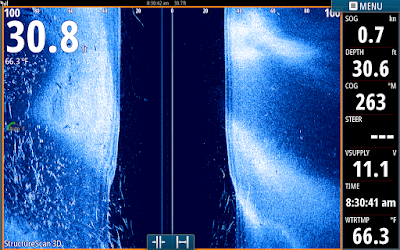 Today I am going to show a couple of screen shots concentrating on locating and zoning in on fish exclusively. 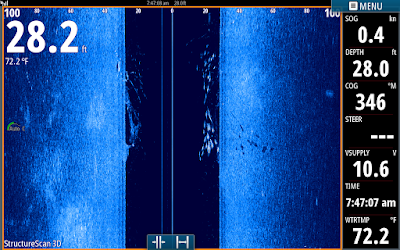 In these pics I am only showing a side scan screen shot without any maps or sonar screens. When you look at this screen shot the boat is currently at the top center of the page just under the 0. I am in a 100 foot scale which means I can see out to the right and left sides of the boat 100 feet. Everything below the boat is history, the distance behind the boat is relative to how fast I was going. I was going 3/4 mph in this shot so at the bottom of the page you are seeing what could have been as much as 80 to 100 yards behind me. 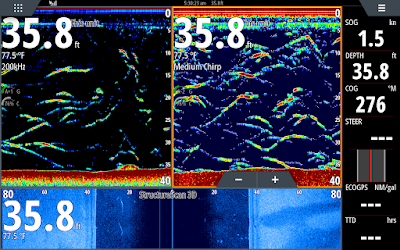 Assuming the total distance from top to bottom is 100 yards you can see halfway through the pic [50 yards back] off to the right of the boat 70 to 100 feet are the beginnings of a school of Stripers. If I was on a larger scale I may have seen that school go out much further. 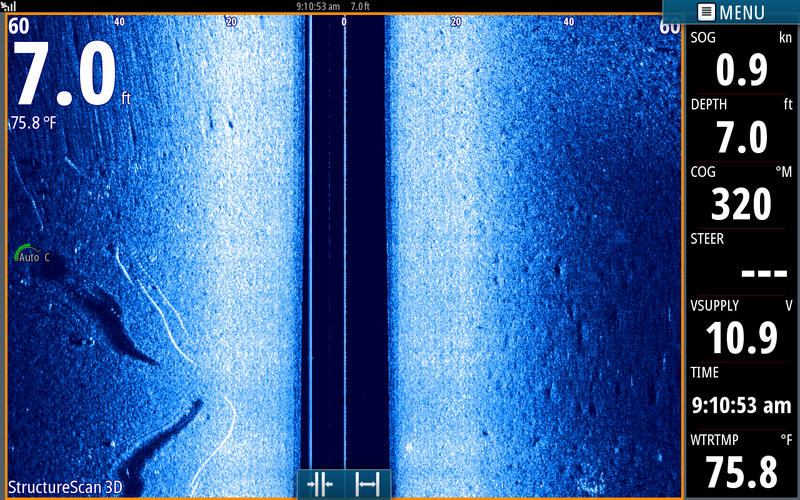 Without side scan I would have never know that there were fish that close to me. What I do when I see this is touch my screen where the fish are and establish a waypoint which puts it on my map but also tells me the distance I need to go to get back to that spot. Off to the left of the boat between 60 to 100 feet is a dark blue area which is the channel. The reason it is dark is that it drops off deeper that the pings from the transducer traveling sideways can pick up. The pings are similar to shining a flashlight out to the side of the boat. Where the bottom drops off drastically the pings or light cannot pick it up because they travel in a straight line. In Striper fishing schools often use the channel as a highway but most often they keep a relative distance from it paralleling it. Here they are about 100 feet from it heading down the lake. Once I get over the school I try to determine which direction they are going keeping my boat about that far off the channel to stay on the school. At the top of the page 25 feet to the left is a small school of Gizzards. In this shot at the bottom of the page I noticed fish off to the right of the boat continuing out to the channel. These showed up as small white dots with a few shadows in them. As I continued up the page more isolated small dots came into view on the left. Eventually I had them on both sides of the boat towards the top part of the page. 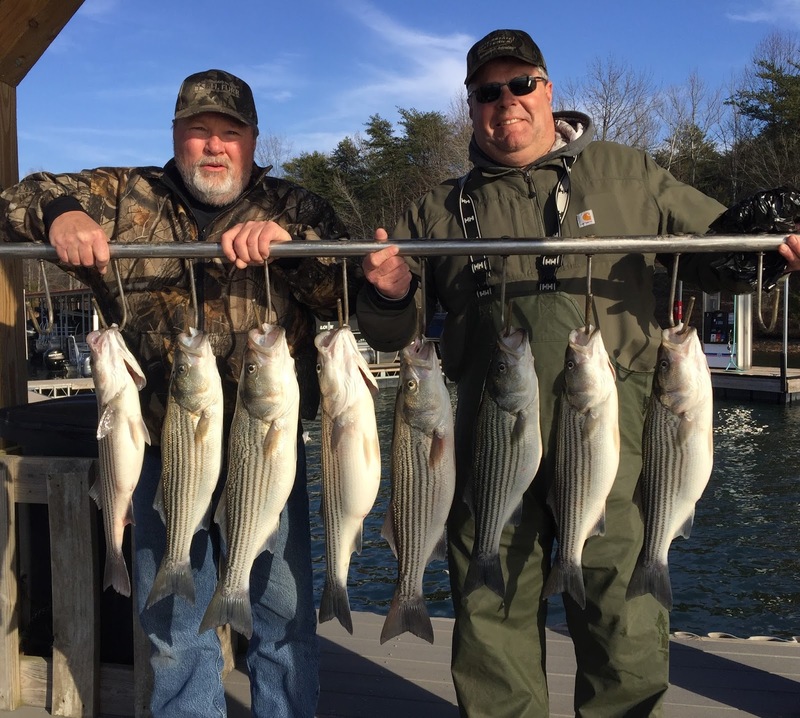 These all were small Giz, white perch and immature Stripers. Here I am around small Stripers but primarily on the left side of the boat. The darker marks beyond the fish are shadows of the individual larger fish in the group. When looking at this page remember the boat is at the 0 line. The dark blue is the water under the boat, here it is 32.2 feet deep. Then the lighter blue is the return from the bottom up towards the surface right and left of the boat. 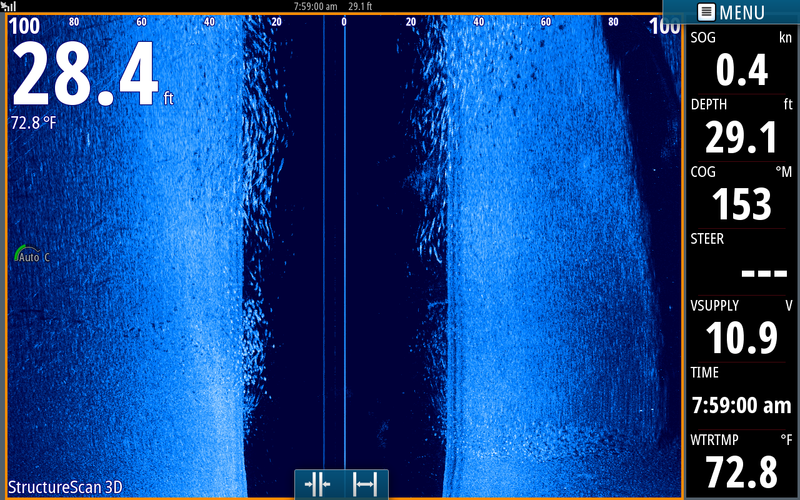 This screen shot shows me going over a couple Stripers that were only right under the boat off a few feet to the right. You can see their shadows further to the right of the fish. 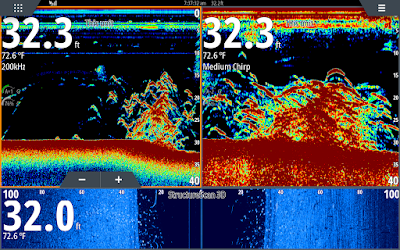 In this pic side scan is showing hard bottom [lighter and brighter blue] with softer bottoms [medium blue] interlaced over the bottom of the lake. Notice the fish are relating to the softer bottoms. By recognizing this I can focus on pattering schools and following them over the softer bottoms that particular day. 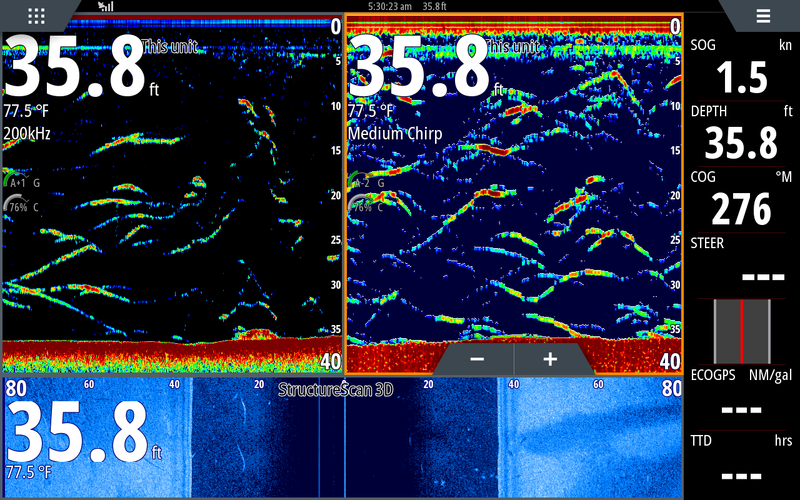 Many people say side scan doesn't do them any good in shallow water. In this screen shot I was on a 60 foot scale because I was working 10 foot flats. Off to the left of the boat I noticed a couple of fish [white lines] with shadows behind them. My second and third planner boards were hooked up when I snapped this shot. 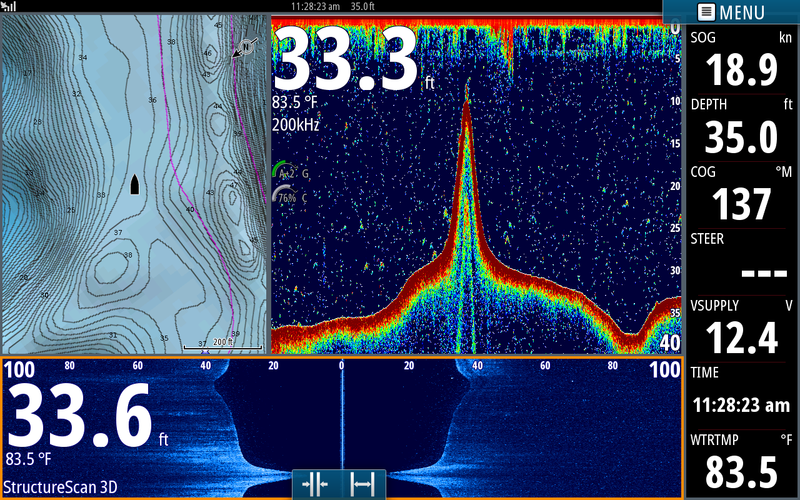 Side scan is also invaluable in locating bait in shallow water. Hopefully you may have a better understanding of deciphering what you are seeing on your side scan. These pics were only of fish, side scan is awesome for locating structure as well. I will show how important side scan is in locating structure at a later date. I will be at the Fishing Expo this weekend in the electronics portion of the Greentop booth. Stop by if you have any questions about your unit or if you are interested in seeing this on your boat this year. Good electronics and understanding them can make your trips much more productive and rewarding. 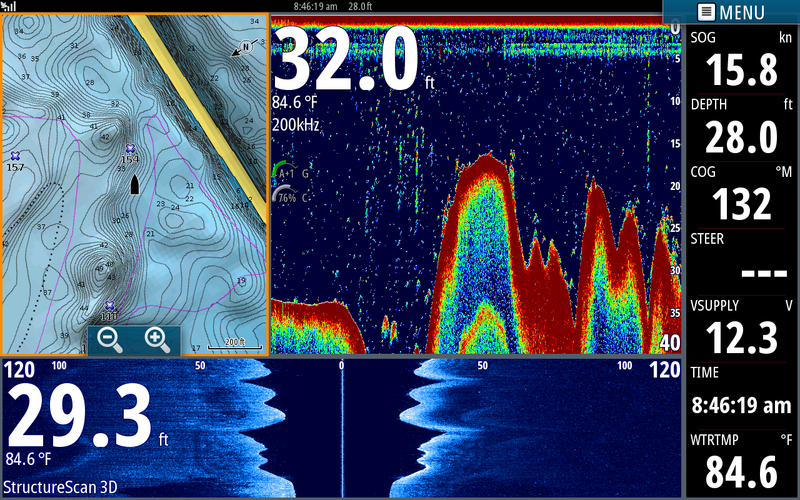 I am often asked how and why I locate fish using my electronics and what the screen looks like when I see fish while running 20 to 25 mph. In the lake I fish Stripers are very spooky. 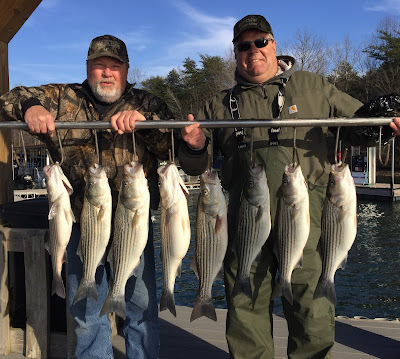 If you go less than 5mph Stripers will get out of the way of the boat but if you can run at speeds where they can not escape you will locate schools of fish and bait much easier. When I am searching I cover as much different terrain as possible, checking out different depths, breaks, channels, creek mouths, humps, points etc. Once I find a particular pattern I use it to stay on Stripers through out the lake. Here are a few screen shots from my Simrad and I will try to explain what I am looking for. I usually use this same page setup while looking for Stripers. I like my Navionics map on the left, my echo or sonar page large enough to see fish and also I want my side scan working for me. You can click on the picture to enlarge it. 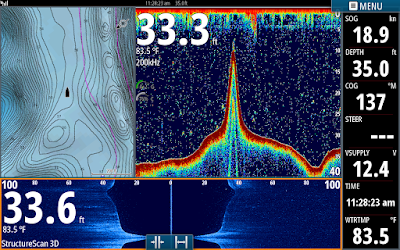 This is a great example of locating schools of Stripers while running around 25mph. Looking at my sonar screen what you see on the right side of the screen is what is currently under the boat and as you look back to the left you are looking into history. When I snapped this shot I had come off of plane and was only traveling 1.2 mph but on the left of the screen I was moving about 25mph. On the left you can see motor noise [small vertical dashes] then a tight group tiny red arches. This is what a tight school of Stripers look like at 25mph. I see them and start to throttle back seeing some scattered fish and as I slow even more to about 10 mph I clearly see larger arches [about midway on the screen]. I pull the throttle all the way back to stop and you can see as I came off plane from the surface down to about 20 feet air bubbles developed from my boat wash [rays of yellow]. Notice the slower I go the more defined and larger the arches are. 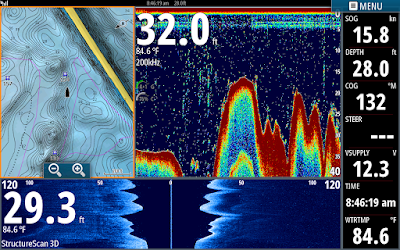 When I am running I want to see motor noise which is yellow but I am looking for color, red on this particular pallet, which indicates something dense, either bait or fish. 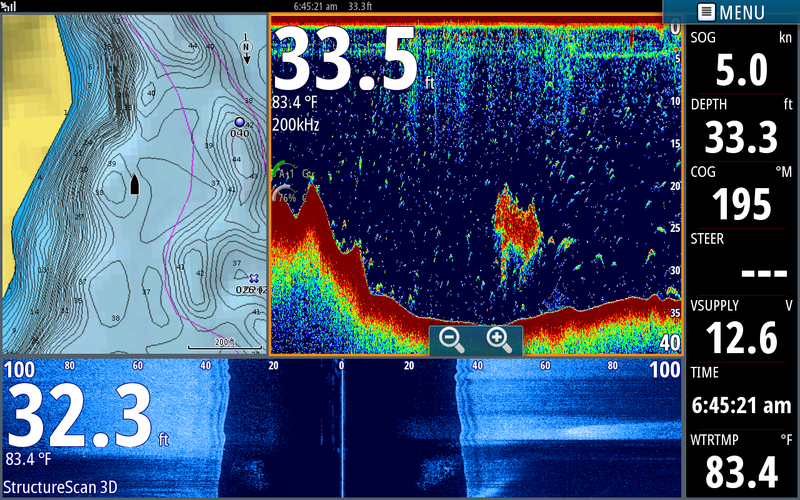 I also am looking at my side scan when I locating fish. On the structure part of the page [lower third in blue] the boat is at the top of the structure page at the number 0 and history is below it. I am looking 100 to the left of the boat and 100 feet to the right of the boat. If your transducers are set up properly you can use structure scan at ANY speeds, as can be seen in all of my screen shots. Now looking at the side scan I noticed while running 25mph fish off tho the left of my boat and as I slow down I continued to see more to the left vrs the right side of the boat. 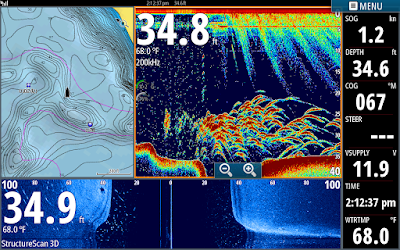 When I turned the motor off I deployed my trolling motor, turned it to the left where I saw most of the fish, put downlines out at 25 feet and before we could get many out everything hooked up. In this pic again I was searching for fish running mid 20's checking out 30 foot flats nearby the channel. 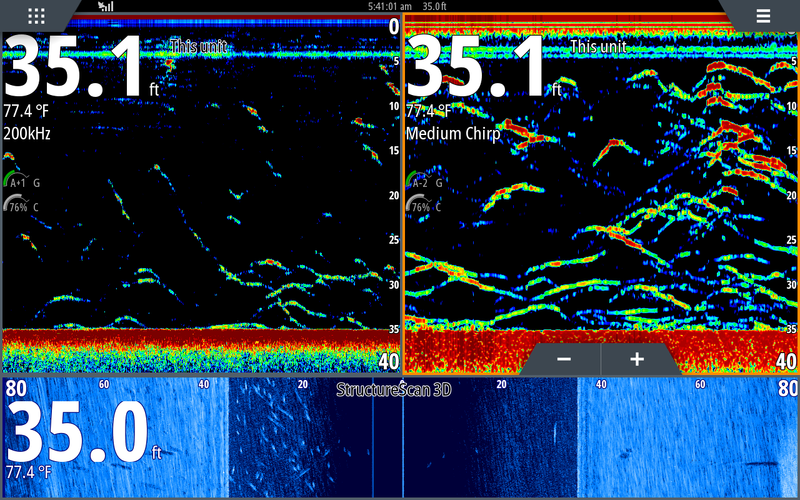 I went over the channel on the left side of the sonar page and saw Stripers [small inverted red V's] stratified 25 to 30 feet. I turned and came up on the flat and saw a few but hit the channel again and saw Stripers stacked in it. Again I had motor noise on the screen but I was looking for color which turned out to be Stripers. Unfortunately this is not a good fishing scenario, on this lake when the fish are in the channels they usually are not feeding. We can catch them on the edge or up on the flat but seldom over the channel. This shot is just an example of when I run I have my sensitivity or gain up high enough to see motor noise but I am looking for color to indicate fish. Largemouth were positioned around 28 feet deep on the edges of this break and a few were suspended at the same depth off the ledge. 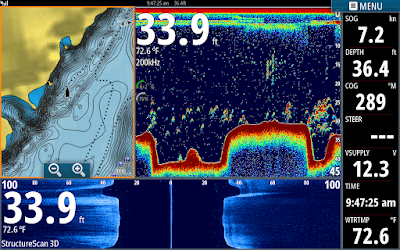 Sometimes Stripers are schooled so tightly they are hard to distinguish between bait or fish. Here I was running in the 20's seeing motor noise then tripped over a super tight ball of something. As I looked closer I saw arches in it so I turned around and checked it out. Turned out to be a very tight school of Stripers. We set up on them but only caught a couple. Unfortunately the Stripers that morning all over that area were tightly balled and it was frustrating to locate and catch just a few out of each school. This particular day fish were relating to ledges, so I kept zig zagging over the drops trying to locate enough to set up on while running on plane. I finally located enough to set up on as you can see on the extreme right of the drop. Hope this helps you decipher what you are seeing while looking for fish on your body of water. I will be posting more screen shots in the near future with explanations of what I am looking at on the screen. In the mean time come see us at the Sportsmans show this weekend, I will be in the electronics section of the Greentop's booth. We will be happy to answer any questions you may have about your units or to assist you in hooking you up with a great Lowrance or Simrad.